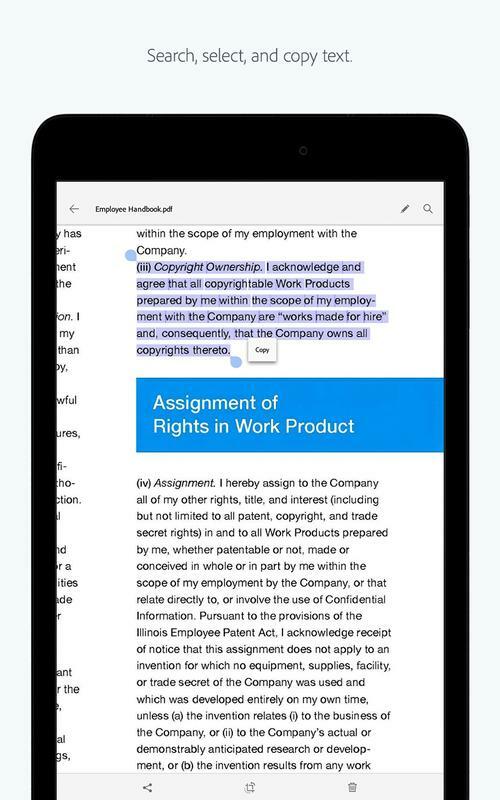 The free document scanning app from Adobe, with integrated OCR technology to instantly recognize text. 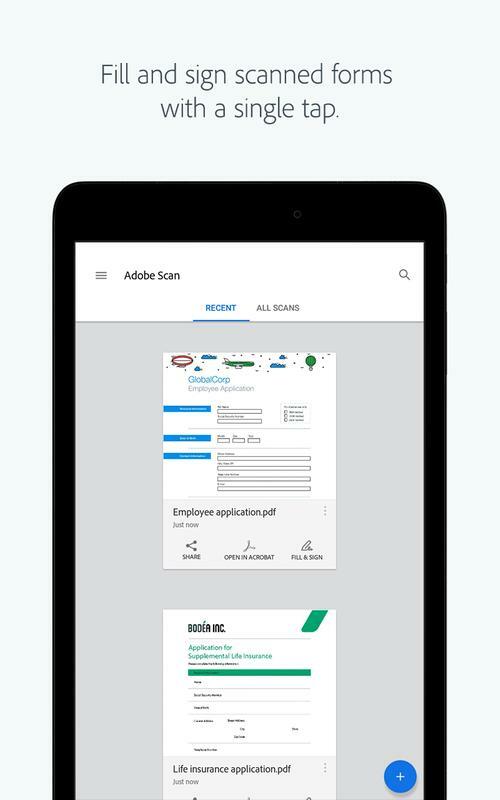 With Adobe Scan you can transform anything into digital - scanning documents, photos, notes, tax receipts or even save multiple business cards to contacts. 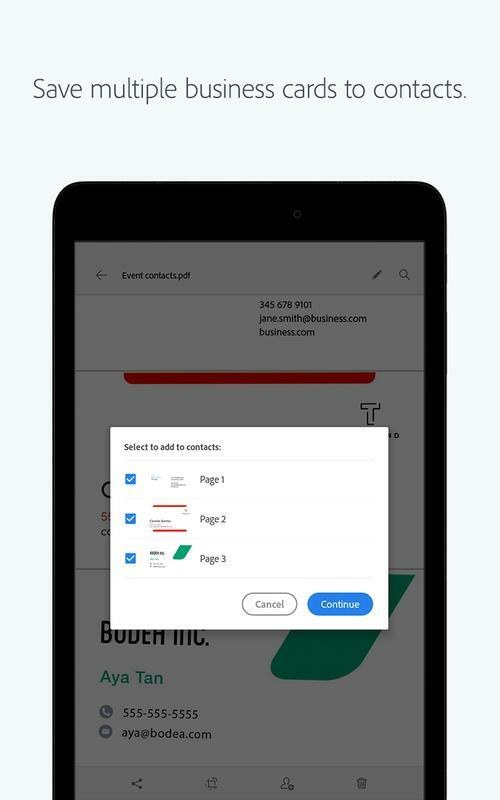 Using the automatic text recognition technology you can easily edit, copy and save your scans to an Adobe PDF - ready to share with your contacts. With the Adobe Scan document scanner app, you can make anything scannable. 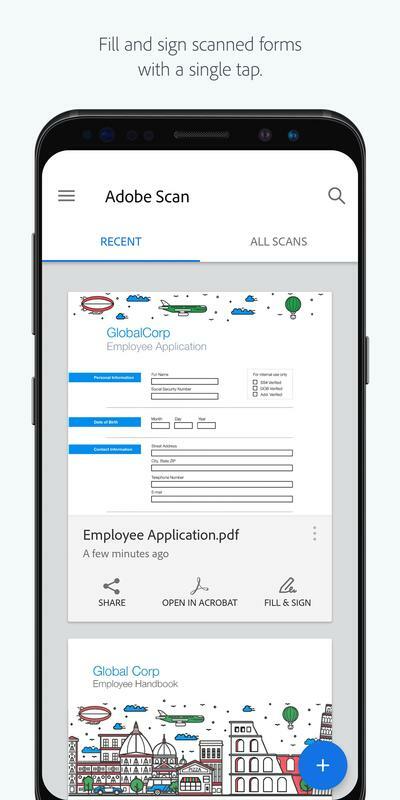 Use the PDF scanner to quickly create a photo or PDF scan. Scan and go right back to other important things. • CAPTURE DOCS, BOOKS, TAX RECEIPTS AND MORE. 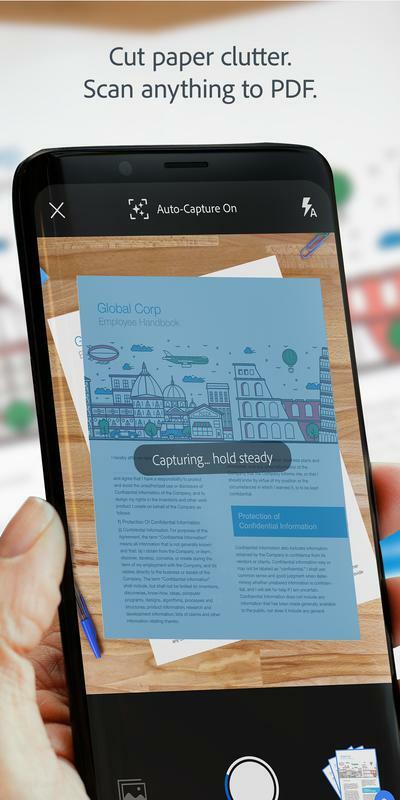 Scan anything with precision with this mobile PDF scanner app. 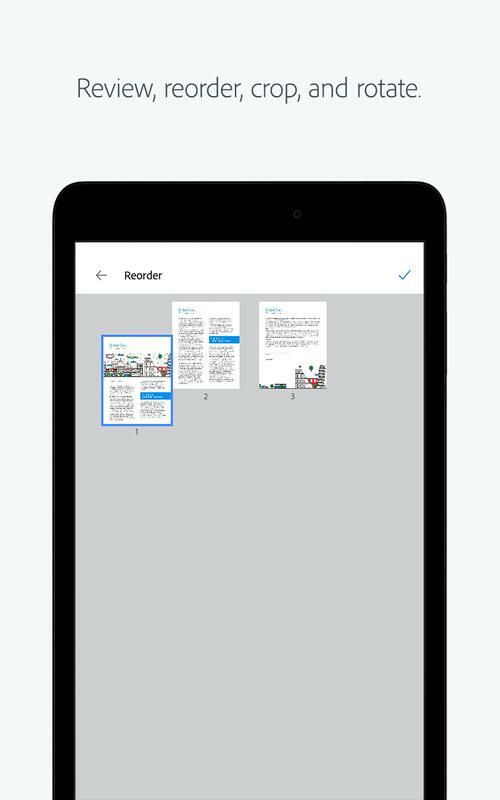 Advanced image technology automatically detects your documents for borders, sharpens scanned content, and recognizes text (OCR). Touch up scans, photos, and documents from your camera roll. 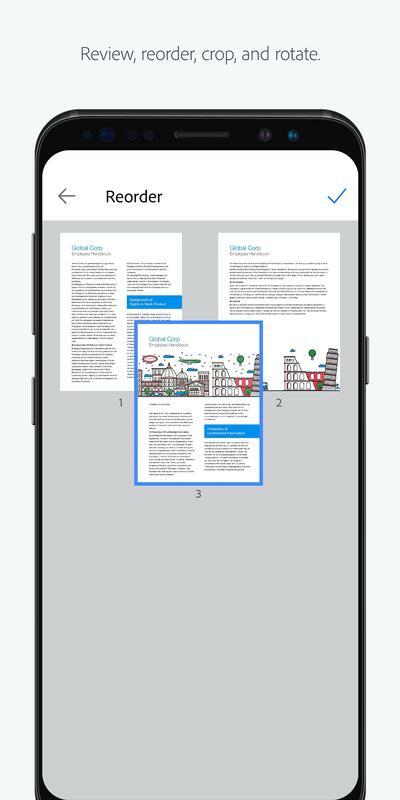 Whether it’s a PDF or photo scan, you can preview, reorder, crop, rotate, and adjust color. • REUSE WITH THE OCR SCANNER. 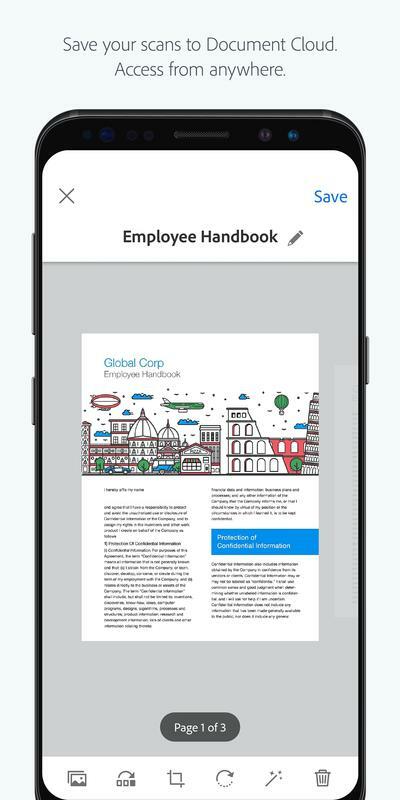 Turn your photo scan into a high-quality Adobe PDF document that unlocks content through automated text recognition (OCR). 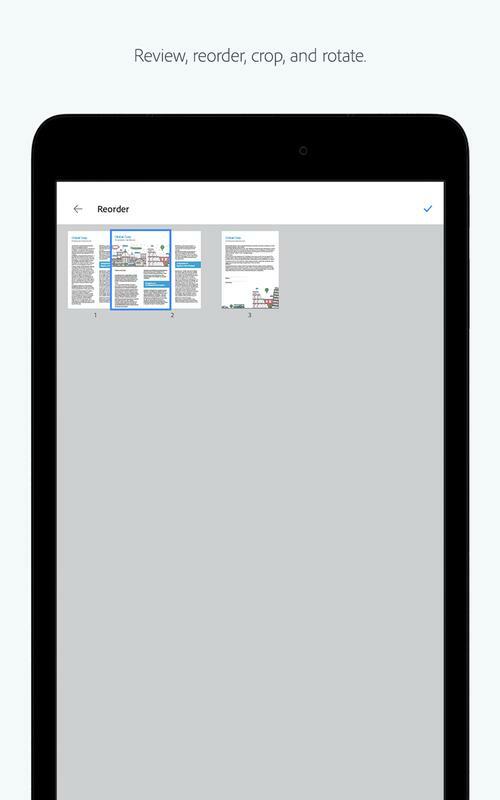 You can reuse content after scanning PDF documents thanks to OCR. Using it as a book scanner can digitize bulk pages, fast! • SCAN ANYTHING, ANYWHERE, ANYTIME. Capture forms, tax receipts, notes, and business cards with this mobile scanner. 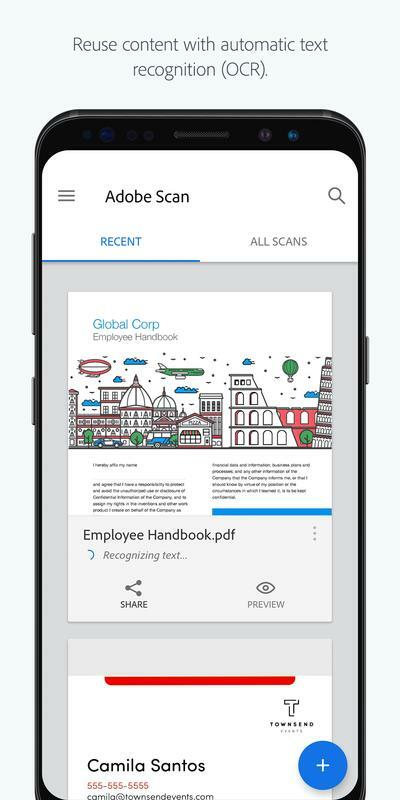 The Adobe Scan scanning app can be used as book scanner or receipt scanner and even lets you scan multi-page documents and save with a single tap. The Adobe Scan to PDF scanner makes any content scannable and reusable. 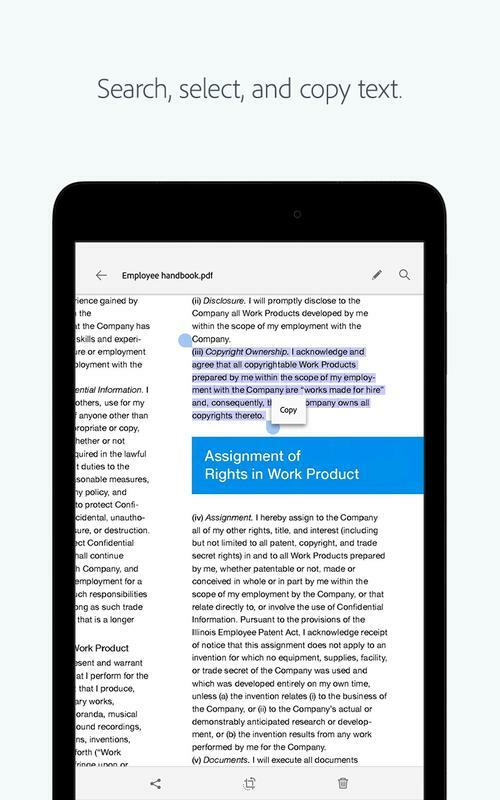 Free, built-in optical character recognition (OCR) lets you reuse scanned content by creating a high-quality PDF that you can work with in Adobe Acrobat Reader. 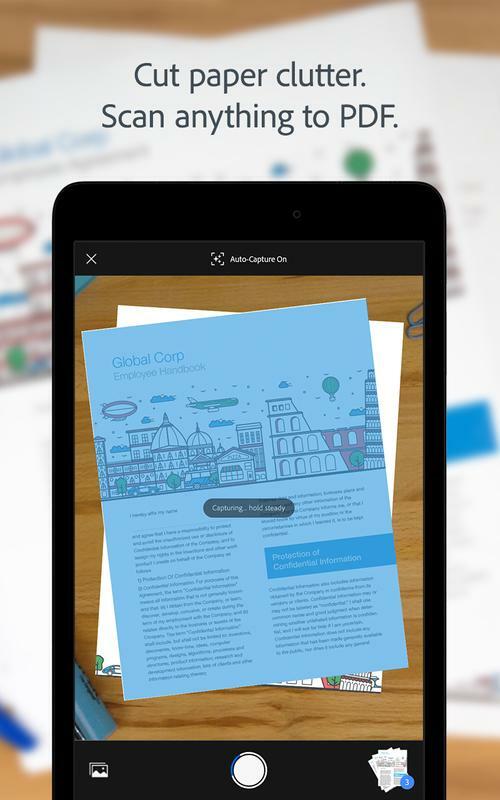 Even turn Adobe Scan into a tax receipt scanner so you can highlight expenses with ease. 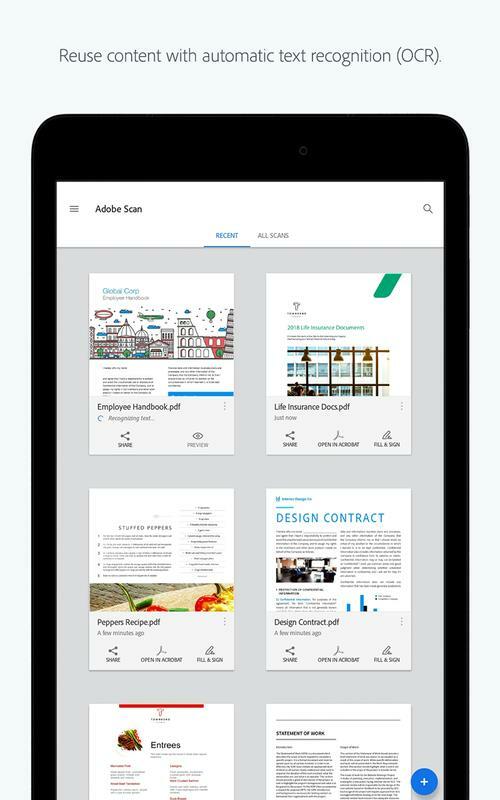 • QUICKLY FIND DOCUMENTS IN PHOTOS. 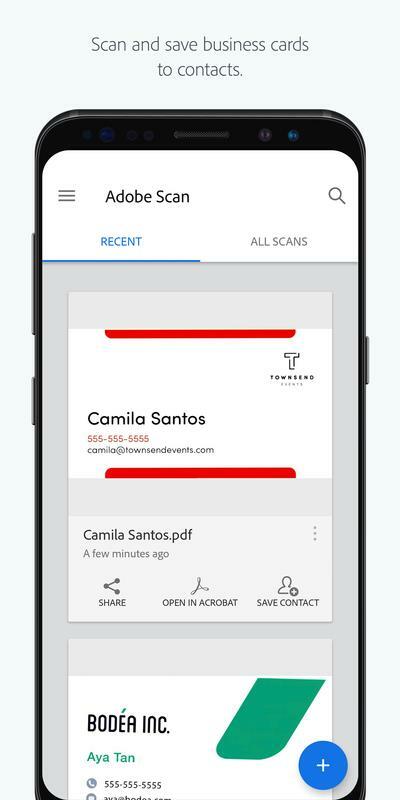 This powerful scanning app automatically finds documents and receipts in your photos and turns them into PDF scans, so you don't have to. 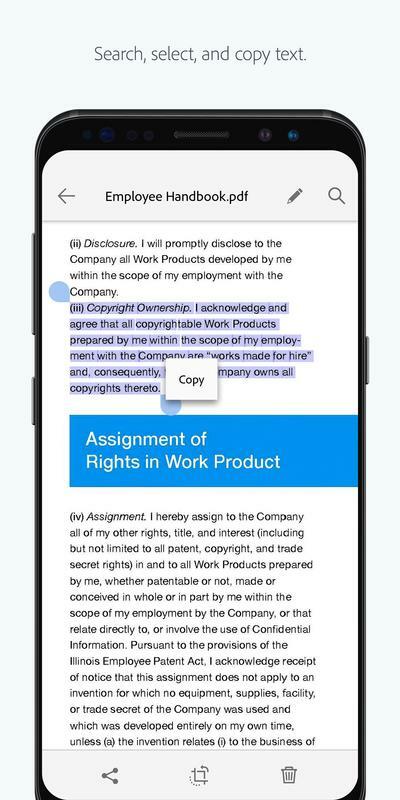 Automatic OCR turns text into content you can edit and reuse. Do you have lots of business expenses? The receipt scanner will help collate all of your expenses together. 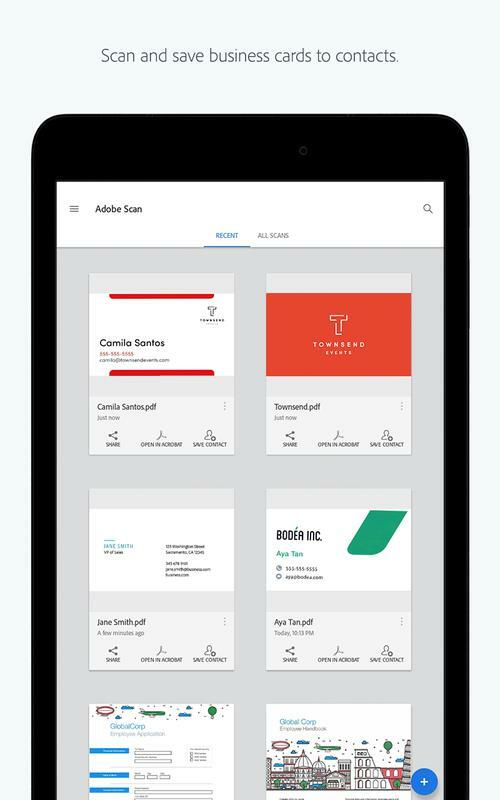 • SAVE BUSINESS CARDS TO CONTACTS. 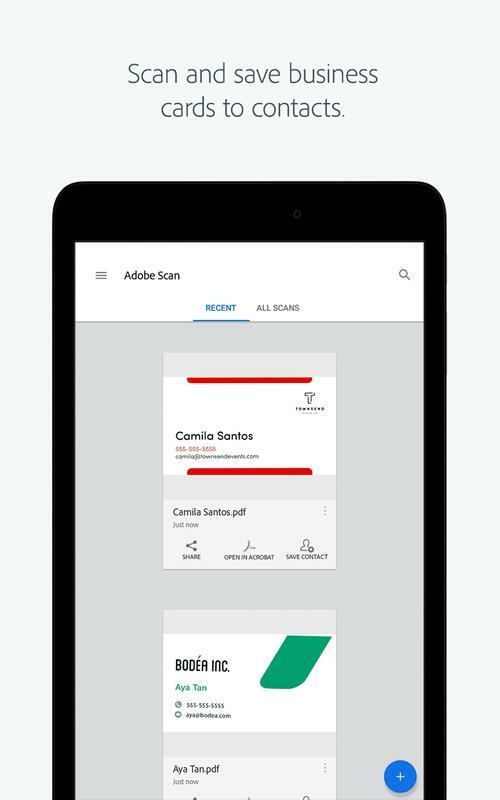 Scanning business cards turns Adobe Scan into a fast business card scanner and reader. 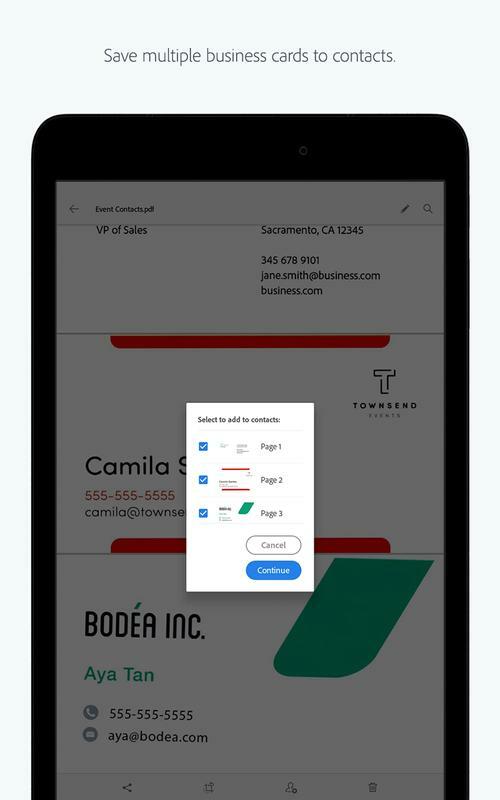 Contact information will be automatically extracted while using the business card scanner, so you can quickly add to your device contacts — no typing needed. 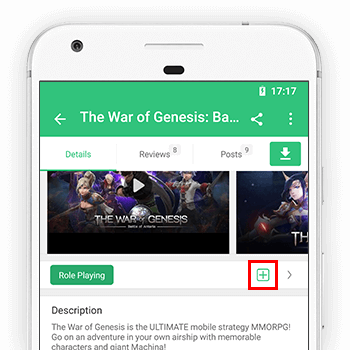 • GET MORE DONE ON THE GO. 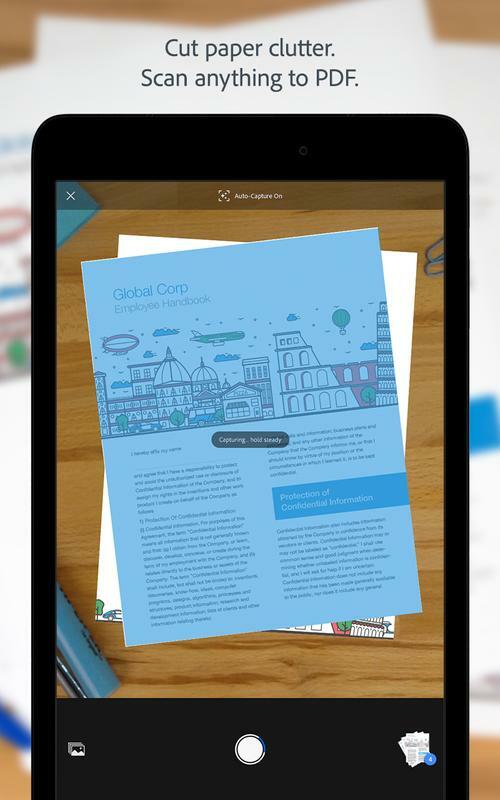 Save each PDF scan to Adobe Document Cloud for instant access and sharing. 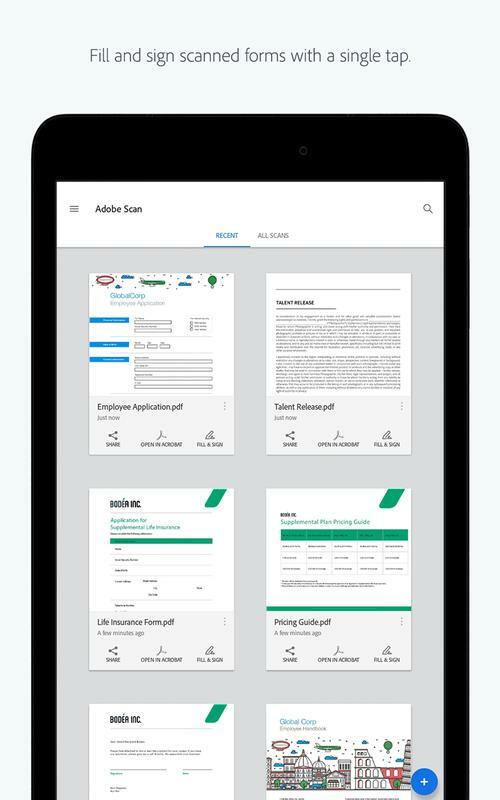 Even lengthy legal documents become manageable and scannable with the Adobe Scan scanning app, which lets you search, select, and copy text. 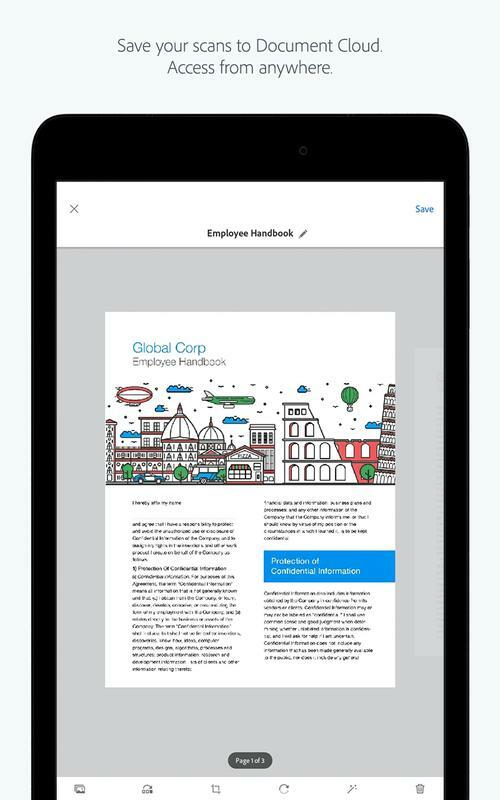 You can also open a PDF scan in Acrobat Reader to highlight key sections and add comments to your documents. 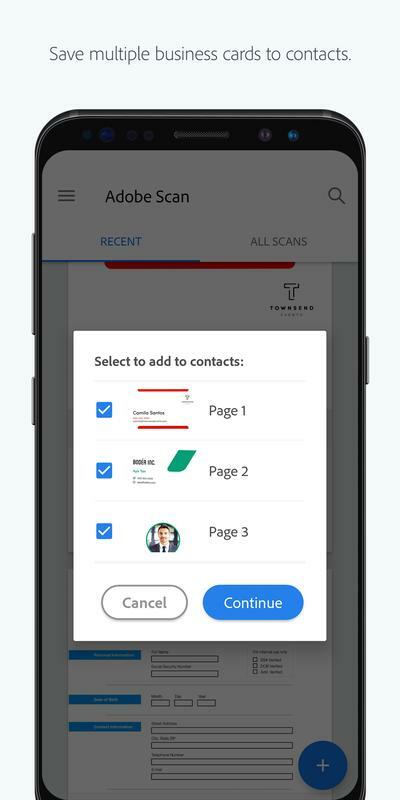 The Adobe Scan document scanner connects you to the world’s best document services that let you do even more with your PDFs. 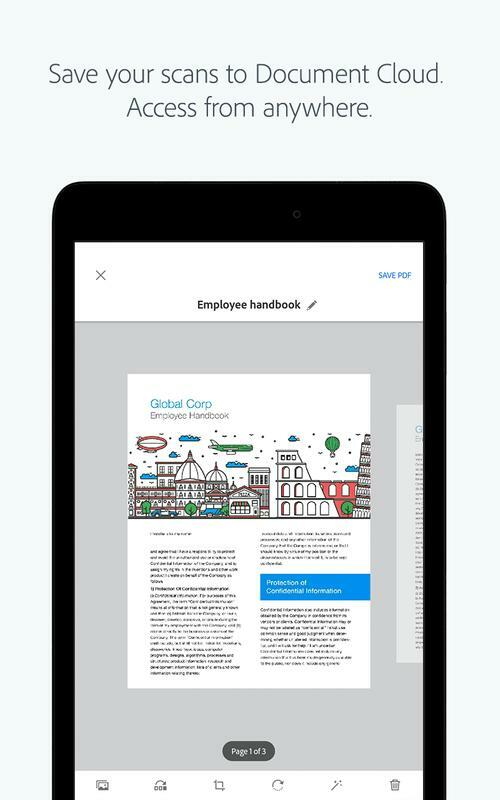 Edit PDF and photo scans, convert to Microsoft Office, fill and sign, and send for tracked signatures. • Select and share multiple files at once via a link or email.